Painted from life, in a realistic manner, although I used gray tones instead of the actual yellow and red pear colors. I was watching the black and white movie "Who's Afraid of Virgina Woolf" while painting, so maybe that was an influence, lol. I think the change in color makes them look surreal. 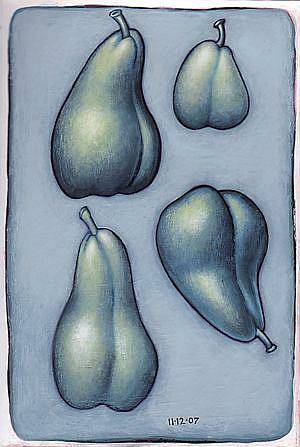 The pears really had these interesting, sensual shapes, and I have not exaggerated them. I wish I knew what type they were. Not your typical Bartlett pears, obviously.